The movement is still somewhat small and the challenge is big — more than 8 million metric tons big — but UC Santa Barbara chemical engineer Susannah Scott, leader of the Mellichamp Academic Initiative in Sustainable Manufacturing, is confident that something can be done about the ubiquitous issue that is plastic. 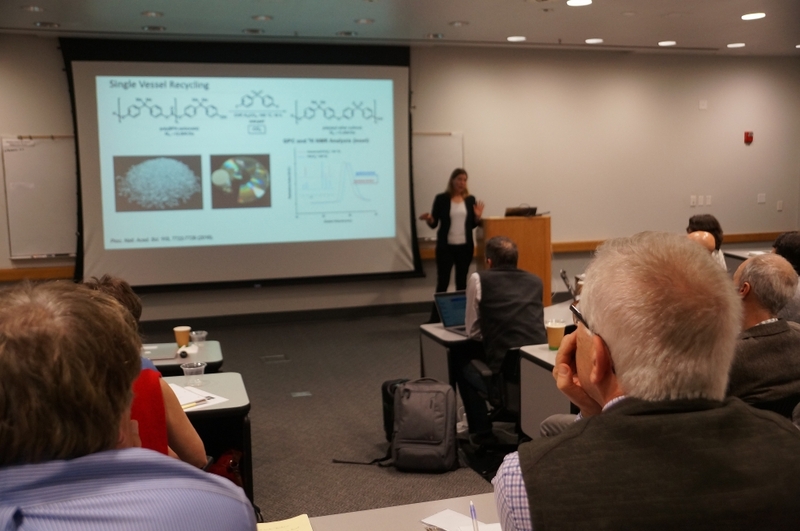 So were the 40 or so guests — members of industry, experts in the scientific community and up-and-coming engineers and scientists — who attended a two-day polymer upcycling workshop held at Elings Hall (California NanoSystems Institute). The purpose, said Scott, was to start some of the best minds on cracking the problem of plastic. 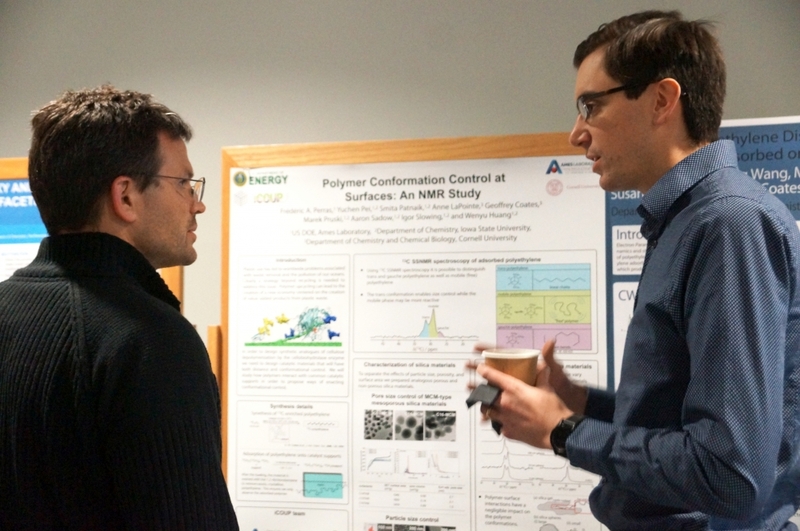 In a series of presentations and informal discussions, the industry participants presented the practical challenges of recycling and upcycling polymers, while the academics and national lab researchers had the opportunity to pitch their ideas and potential solutions. “That kind of cross-communication is really important,” Scott said. Despite all global efforts to recycle our plastic goods, an astounding 91 percent of it never gets reused, primarily because it’s cheaper to make new plastics than it is to recover and repurpose existing plastic. Add to that shifts in the recycling market, with China — previously the biggest importer of the U.S.’s used plastic exports — cutting their imports drastically, and diminishing space in local landfills. The time is ripe, researchers say, to confront the endless stream of plastic, much of which has already invaded our environment and our bodies, and will take decades to centuries to fully degrade. 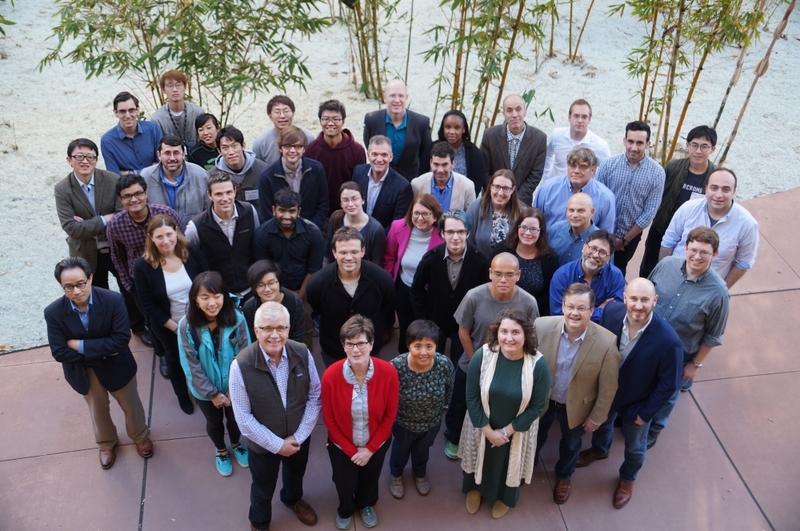 To meet this challenge, participants in the recent workshop approached it on several levels, from the molecular — with highly technical talks on the different strategies that can be employed to treat specific polymers — to the broad, with assessments of the current economic, social and policy-level landscape. The good news? Single-use plastics are the subject of several new and upcoming bans, including one by the European Union to take effect in 2021, and one this year in Bali, Indonesia, in a region of the world that has seen an astonishing amount of plastic trash end up in waterways and beaches. Results of single-use plastic bans have already yielded major improvements both locally and internationally, and more municipalities around the world are planning to phase out single-use plastics in an effort to stem the tide. Recently, one of the world’s biggest packaged food companies — Nestle — announced plans to eliminate single-use packaging in favor of fully reusable or recyclable versions. Hefty — maker of trash bags — is attempting to deal with unrecyclable plastics with its EnergyBag program. Many heavy hitters in the plastics industry have teamed up to create the Alliance to End Plastic Waste, some members of which were present at the workshop, where participants focused on the new strategy of upcycling plastics — turning various used or scrap polymers into more valuable products via chemical transformations. "The recycling efforts, I think, though very well-intentioned, have not been successful because the recycled products are always lower-value than the products you would make from the pristine material,” Scott explained. Upcycling takes a different approach, she said: What could be done to add value to the material so that the products are even more useful, instead of being trash? Where is the technology to make it happen? By refining and spreading best recycling and upcycling practices, it is possible to create a circular economy for plastics, said the researchers, one in which each stage of the cycle anticipates the next. For instance, plastics would be formulated in a way that allows for large batch processes to efficiently break them down into their reusable constituent parts, or to add value to the material, making it as cheap as possible — and hopefully profitable — to collect and reuse plastic. Alternatively, plastics could be made with shorter lifespans to avoid the problem of their persistence in the environment. While it’s still a matter of time before the technology catches up with the desire to efficiently, sustainably and profitably upcycle plastics, Scott said, the economic driver exists. 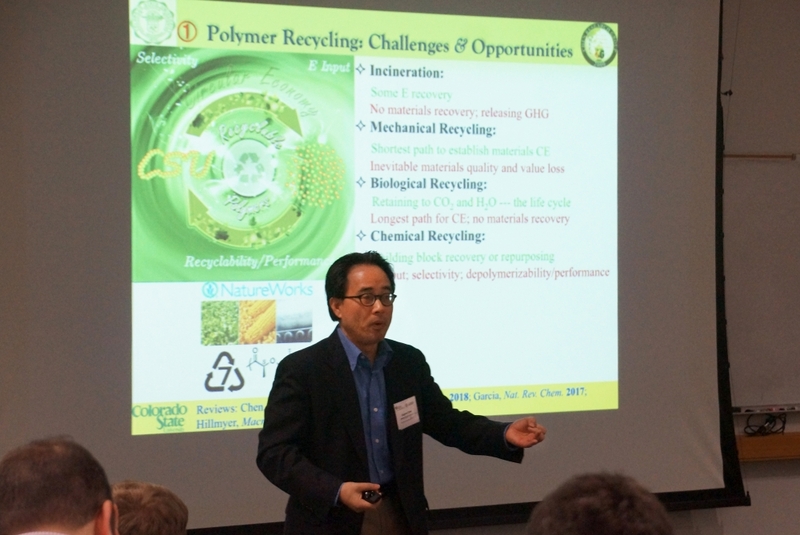 UC Santa Barbara, for its part, plays a major part in a forward-looking project that was just funded by the Department or Energy’s Office of Basic Sciences called the Institute for the Cooperative Upcycling of Polymers (iCOUP). Scott is the UCSB lead at the institute. “The researchers and the companies need to work together to make this happen,” she said. 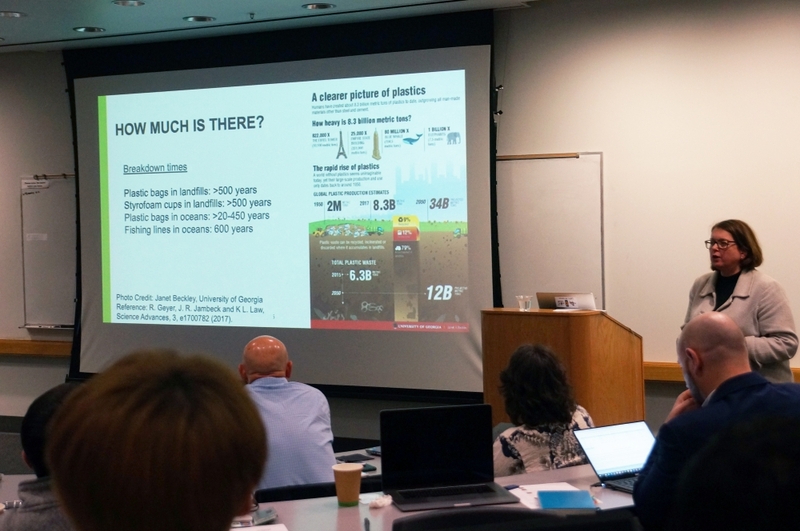 This workshop was the first part of a two-part series that takes an in-depth look at plastic. The second workshop, to be held in late April as a continuation of Earth Day and co-organized by Rupe Professor Ron Rice of UC Santa Barbara’s Department of Communication, will be geared toward a general audience. It will bring together experts from the sciences, social sciences and humanities, government and nonprofit agencies and industry to discuss our conceptions and possible misconceptions of plastic and its recycling, and enhance our understanding of how to manage plastic.